The Taipei Metro Nanshijiao Station is the southern terminus of the Zhonghe Line (part of the Orange Line) located in Zhonghe District, New Taipei City, Taiwan. It is built on the site of the old Zhonghe Railway Station, which ceased operations in 1990. This four-level, underground station has an island platform and four exits. The area above ground is currently being developed into a new high-rise building. The Taipei Metro Zhonghe Depot is located on the southeast side of the station. Art in this station has a theme of "Youth Melody" and cost NT$4,999,000. 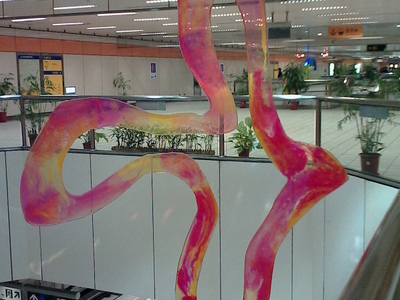 It includes numerous pieces of colorful public art created by local artist Jun Lai and was completed on November 30, 1998. Consisting of 12 sculptures (3 hung from the ceiling; 9 hung on the walls), they symbolize the passion of youth with a light, joyful tone. Here's the our members favorite photos of "Metro Stations near Zhonghe". 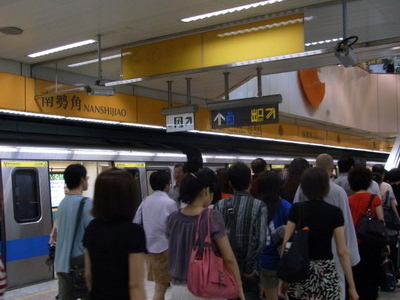 Upload your photo of Nanshijiao Station!